The sonic commons can be defined as any space where people share an acoustic environment and can hear the results of each other’s activities, both intentional and unintentional. Our eyes and ears are forced to deal with those results. This performance uses 4 Ear (dual binaural) recordings, live re-tuned city sounds, speech and images to decypher the cognitive dissonance of the NYC sound environment. 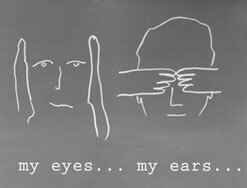 O+A bravely take on the Politics of the Senses by brazenly relying on their ears in this visually-dominated era. commissioned and produced by electronic music foundation ear to the earth 09 with additional support from the experimental media and performing arts center at rensselaer polytechnic institute, linz kultur, kulturland oberösterreich, ske austro mechana.